October Glambag! I have to say I like this months bag as well. I think that Ipsy previously known as Myglam has really been listening to their subscribers and stepping up with their customer service to try to satisfy the majority. This month we got a lip gloss stain, liquid liner, mascara, mini eyeshadow quad and a hair oil. Everything needed to achieve a Bombshell look. Read on for the swatches and reviews. Myglams theme for the this month is "Bombshell".. So they offered products that would help achieve a "bombshell look". They did a great job this month... I'm happy with this bag and I know of others that are happy with theirs as well. I believe Myglam had only 1 card this month.. can't remember exactly.. but the bag is cute and it's a little thick, so it has cushion. The bags are really getting better and better (quality wise. The bag has the famous and now popular "Chevron" design on the outside and red on the inside. I have been seeing the "chevron" design being done everywhere on DIY blogs and YT channels lately.. I guess it's the "in" pattern at the moment. The size we received in our bags is the .5Fl. Oz and on their website it sells for $12. They also sell 2 other sizes and the price ranges from $32-$50. We also received a mascara by theBalm. 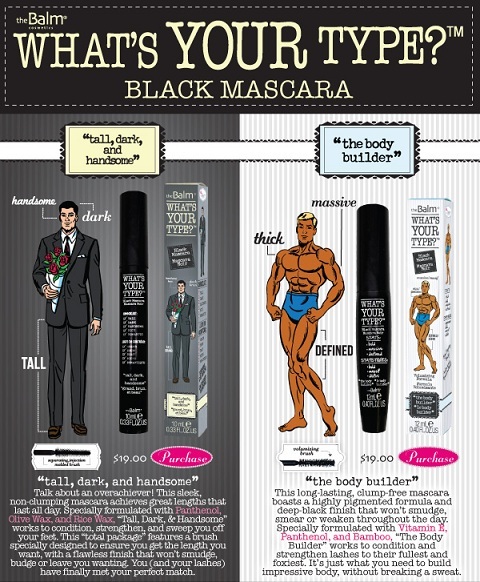 TheBalm has 2 different types of mascara "the body builder" and "tall, dark and handsome". I don't know what type of man you like but I certainly like the "tall, dark and handsome" type. However, I like my eyelashes the opposite, so I am glad that I received "the body builder". I'm not sure if they were offering both mascaras but most of the people I know received "the body builder". I didn't really see a difference with this mascara and any other mascara I have used in the past. I'm not a huge mascara fan because I can never find one that I love to fit my lashes. However, it did make my lashes appear thicker. You can get this mascara or the other one for $19 off their website. I like this liner a lot. It comfortable to handle and goes on dark enough to where I don't have to apply it twice. It can be a little troublesome trying to get a thin line because the tip is a little thick but if you hold it tip straight you'll get that thin line. I need to work on getting a faint cat eye with it as well but like I said earlier I do like it. Ipsy was giving out 2 shades to this gloss, this red and a pink one. I would have loved the pink one but this red fit all the contents of my bag well. The description they have for this gloss stain is on point. It is certainly pigmented and moist with a nice finish. I don't think it's feather light though. When I say pigmented, I mean pigmented. No need for a second coat or reapplying it over and over and no need for a lipstick underneath. If it didn't own this product and just saw it on someone I would have thought it was a high shine lipstick. Myglam had 7 different sets and combinations to give out. I believe mine is set #5. I love it, it's a great fall palette. The colors are pigmented and go on smoothly, they blend quite smoothly as well. It would have been nice to get the full size of the hotpots since they are so inexpensive but the smallness of the pots are so cute and adorable haha. It's really travel friendly. I'll start with red (vibrant red, frosty taupe, vanilla sky, raisin berry). I love how the names fit the color well and you can easily tell what names go with which color. Don't forget I still have my BagBlaze GIVEAWAY up till the end of the month! thought this was a great bag!!! love it!! Loved this months bag. I'm so jealous!! You got the red eye shadow!! woohoo!! aww which set did you get? !